CREATE POWERFUL CUSTOM MOBILE APPS BE THERE! Custom mobile apps for iOS & Android. Mobile internet usage surpassed desktop PC internet access by 2013. For websites today, it’s essential that the user experience of visiting the site on a mobile device is as clear and easy-to-use as visitors using a desktop computer. Whether you need a native mobile app or a mobile web application, we have the expertise to develop mobile applications with mobile-specific functionality. – Exceptional customer support focused on generating long term client relationships. – Rapid development using state of the art tools. 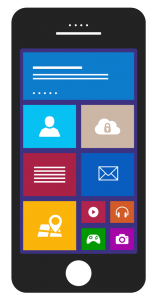 Our mobile solutions are customized for IOS, Android and Windows platforms. XAPP Design can develop mobile apps that can work in challenging environments where connectivity is problematic. We have developed several solutions that work in “disconnected mode” and then sync up when an internet connection is available. Our experience in this area can be invaluable to you and your organization. An initial consultation is free, so please contact us today.